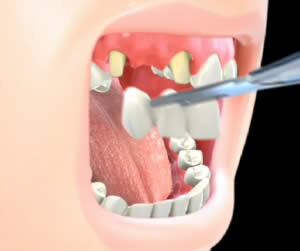 A dental bridge is a false tooth(called a pontic) used to replace one or more missing teeth. The pontic is centered between two attached porcelain crowns, to create a fixed bridge. The fixed bridge is permanently cemented to the two teeth on either side of the tooth gap. Resin bonded – also known as a “Maryland” bridge, false teeth are fused together to metal bands and bonded to the back of the teeth on either side of the gap. This type of bridge is ideal when the missing teeth are in the front of the mouth. Cantilever a type of bridge created to attach to only one tooth on either side of the tooth gap.